If the name R. Buckminster Fuller (1895-1983) brings up any associations in the 21st century, it is for his creation of the geodesic dome. This structure looks complex because it is made of interconnected geometric forms that result in a slightly spherical shape. It has been used for decades as inexpensive and pragmatic shelter, an alternative to more traditional but also more costly methods of construction that involve foundations and load- bearing walls. Buckminster Fuller (1895-1983). The Triad: Twelve Degrees of Freedom; Six Part Push/Pull Tensegrity; and Geodesic Tensegrity Sphere, 90 Strut, Edition 5 of 10, 1980. Stainless steel rods and coated stainless steel tendons. Dimensions vary. Fuller, who was not a trained architect, had countless ideas of this sort and a pithy collection of them can be seen at Edward Cella Art & Architecture through Nov. 3. R. Buckminster Fuller: Inventions and Models includes prints, multiples and objects that demonstrate his methods of making and thinking, the first such show in L.A. since he passed away here in 1983. Most of the work is on loan from private collections. Fuller is known as a visionary thinker and designer but his dedication to saving the planet from the drives and demands of its inhabitants has greater relevance today than when he authored Operating Manual for Spaceship Earth in 1969. His ideas for addressing over-population, scarce resources, urban congestion and global migration dating back to the 1920s, remain inspiring and influential today. 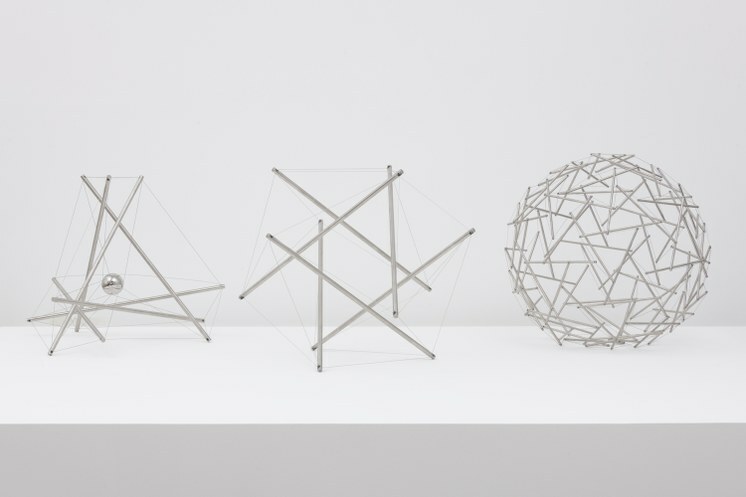 This show includes a number of open-weave globular objects made from stainless steel rods held in place by wire or hinges via his method of “tensegrity,” the word that he coined for tensional integrity. The structures, not more than two-feet in diameter, appear solidly constructed but their strength comes instead from floating compression with the rods balanced against one another. Buckminster Fuller (1895-1983). 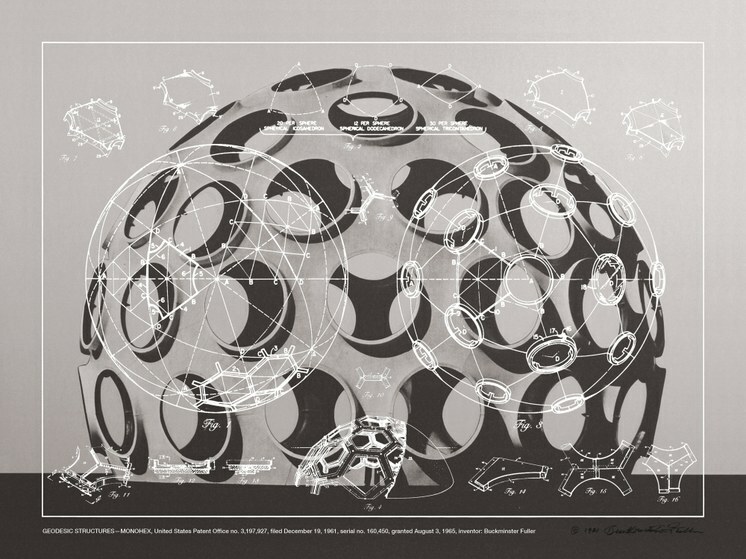 Geodesic Stuctures - Monohex, From Inventions Portfolio, Edition 7 of 60, 1981. Screenprinted clear film, a duotone screenprint on Lenox 100% rag paper, and a blue backing leaf of Curtis 100% rag paper. 30 x 40 in. (76.2 x 101.6 cm). 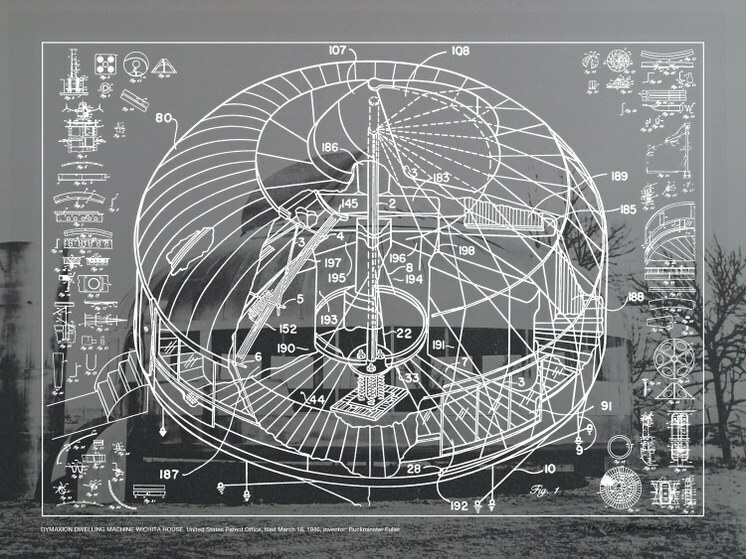 The show also includes a series of large multi- layered prints illustrating some of his 25 patented plans for concepts like the Dymaxion Dwelling, a pre-fabricated house that could be mass produced and airlifted into place as needed. More whimsical is the Dymaxion Rowing Shell, a light-weight watercraft made of a seat and oars atop what look like giant knitting needles. An actual example of the Rowing Shell hangs from the ceiling of the gallery. Buckminster Fuller (1895-1983). Dymaxion Rowing Shell, Edition 4 of 5, 1970/1999. Fiberglass, aluminum, carbon fiber, paint. 320 x 8 in. (812.8 x 20.3 cm). 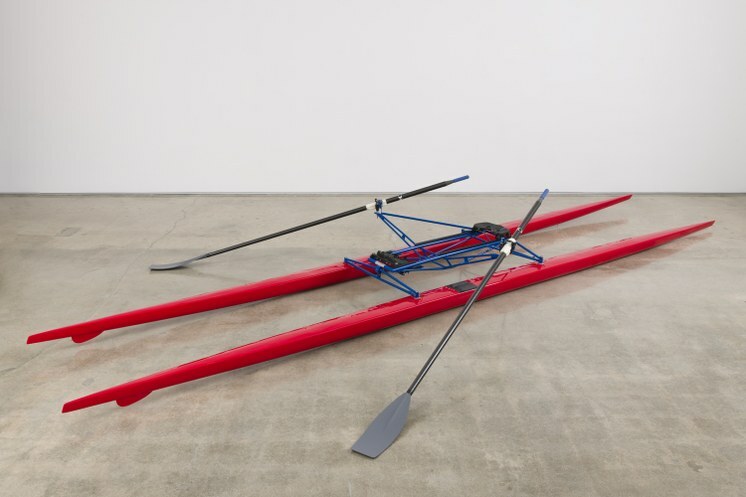 21 feet long by 70 inches wide from oarlock to oarlock, and 24 inches tall. Each oar is 117" inches long. The prints and models were produced in collaboration with Cincinatti-based art dealer Carl Solway, who met Fuller through composer John Cage. The inventor and composer had been teaching together at the now legendary Black Mountain College in North Carolina. Many of Solway’s editions are small or even unique and produced near the end of Fuller’s life. Three posters in the show demonstrate Fuller’s radical humanism including one with white text on black paper asking, “If the success or failure of this planet and of human beings depended on how I am and what I do…How would I be? What would I do?” Fuller’s views and his solutions seem hauntingly pressing today. Buckminster Fuller (1895-1983). 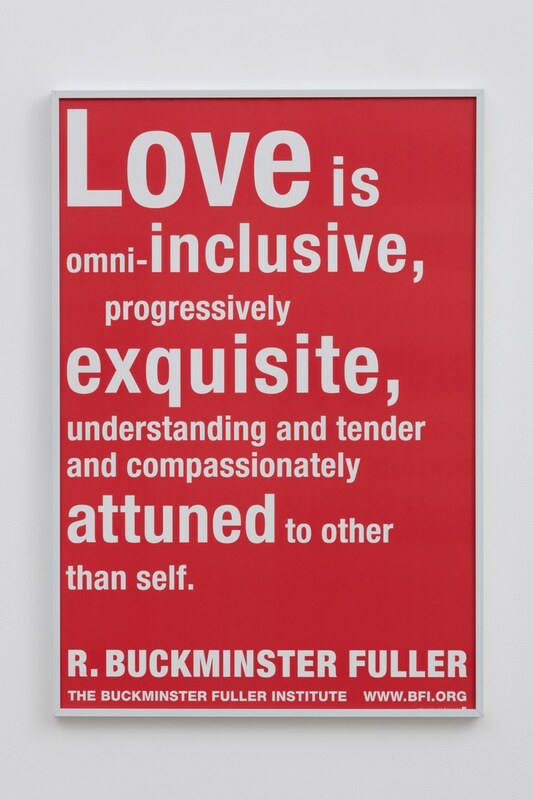 Love is omni-inclusive offset poster. 32 1/4 x 22 1/4 in. (81.9 x 56.5 cm). To learn more about Fuller and his legacy, there are two programs at the gallery. This Saturday, Sept. 22, architect Thomas T.K. Zung, student, collaborator and partner in the firm Fuller, Sadao & Zung, gives an illustrated talk at 3 p.m. and signs copies of his new book Buckminster Fuller, Anthology for the Millenium. On Oct. 13, at 3 p.m. Fuller’s daughter Allegra Fuller Snyder will be in conversation about with David McConville, both of the Buckminster Fuller Institute. For more information, go to edwardcella.com.